What a day, rain, gray skies, creepiest place on earth, awesome sunlight, moonlight dinner. What else can anyone ask for? I could have done without the creepy place, more about that in a bit. For now, I am going to skip my journey from Bellingham to San Francisco. It will follow, but I have to get today on paper before I forget all those different emotions I went through today. through the clouds. I past through salt flats and wide open spaces only to be stopped by the distant mountains. 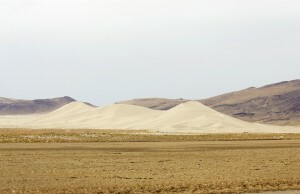 Than there was this huge sand dune, called Sand Mountain. Looked completely out of place. I was a little frustrated that I could not get any good photos of this area. It was a beautiful place in the rain; I can’t even imagine what it must look like with a little sunlight. I hadn’t past a town in a really long time, all the places on the map turned out to be tiny gatherings of trailers off the highway in the distance. 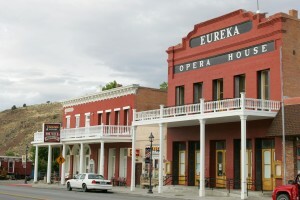 The only larger place between Fallon and Ely, my destination, was Eureka. They even had an opera house. I am jumping ahead. 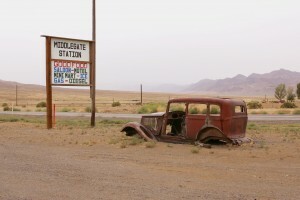 Middlegate Station, highway 50 and route 361.
where you expect someone to jump out from behind a bush with a rifle, like in the movies. So my mind is going a little overboard, I get this strange feeling and wished I wouldn’t be there. 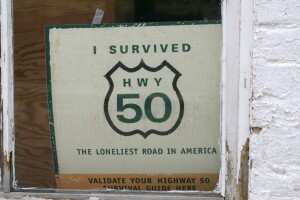 But I couldn’t turn around, not because the road was to narrow, but because I had to see what was at the end. I was pulled by an imaginary force. I did have a little reason to feel creepy. Early on there were the remains of an old car, couldn’t make out the model. As I went on I saw another one. This is the perfect place to lose something or someone. Nobody would ever find you for a million years. At the end of the road was an old mining shaft going straight into the ground, and some kind of wooden tower like structure. I had to get out of the truck to take pictures. Why am I doing this? There was not a sound to be heard, neither from humans nor from animals, just a little wind. There was a cross on the side of the road with “H & M” written on it and down the embankment was another old car, all rust, and it had bullet holes. 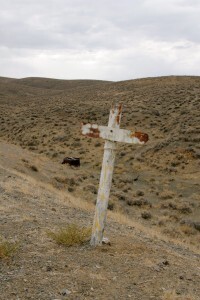 Cross and wrecked car at Quartz Mountain Ghost town. The Shoe Tree. 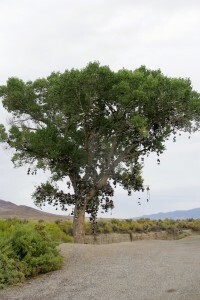 A cottonwood tree covered in shoes. wonderful contrast. I pulled over several times to take pictures. If I had done this all day long I would have gotten stuck in the desert over night, no thanks. Now it was time to hurry up and get to the campsite. I have gotten used to setting up tent in the dark, but I still don’t like to drive at night. Especially not when I am in an area without anyone around. The sun starts to set at around 7 PM, by 7:45 PM it is totally dark. It had started to sprinkle again when I arrived in Ely. I contemplated staying in a motel/hotel. There were several along the main drag. Many of them were casino/hotels. I stopped at one and walked in, the cigarette smell was not pleasant. I forgot, there are still places where smoking is permitted. I walked out and decided to camp. The rain had stopped. I pulled into a gas station to fill up and also to wash some of that grime off the truck before I put up the tent. 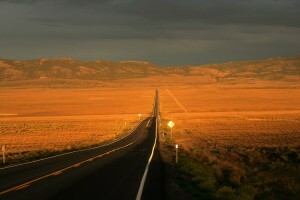 Highway 50 looking east from Pancake Summit, White Pine Nuts Mountains in the background. I safely arrived at the KOA three miles down the road. When I finished setting up tent, the moon had come up over the trees. It was very bright, on the decline, but still almost full. It was so bright that I didn’t need a flash light during dinner. What an incredible day! When was the last time you had dinner by moonlight? I hope I can go to sleep now and not that my mind plays any tricks on me. P.S. I had no nightmares. Only woke up at 5AM because some stupid person was leaving the campsite with the car radio turned up loud. Have a good Labor Day weekend. To all New Yorkers, this is your last chance to check out Coney Island with Astroland before it all gets torn down.